Robert Stewart, Senior Database Administrator at Situs, set out to review multiple control vendor offerings for the Silverlight platform. He specifically wanted to share his experience with fellow developers on his love for Silverlight and the grids, charts, and other controls inside OLAP Silverlight Edition. As a developer, you have choices when it comes to selecting a build platform. If you opt to work in Silverlight, like Robert Stewart, Senior Database Administrator at Situs Group, LLC ( Situs.com ), you have a powerful development platform for creating engaging and interactive experiences for web, desktop, and mobile applications. When electing to further extend the Silverlight platform's capabilities, Stewart turned to ComponentOne Studio, a third-party control set. 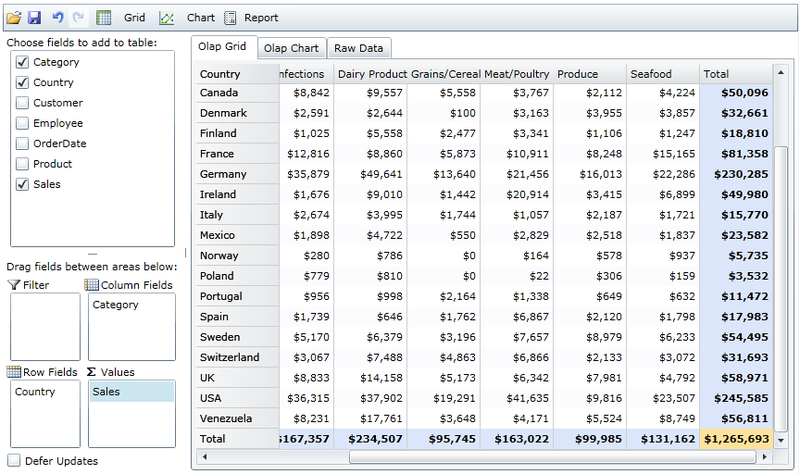 ComponentOne Studio offers a suite of controls for Silverlight, including OLAP for Silverlight. The four unique controls, included in OLAP for Silverlight, allow developers to quickly embed OLAP functionality into their applications and deliver rapid ad-hoc analysis. With the purchase of ComponentOne Studio Silverlight Edition, which includes over 60 additional user-interface (UI) controls for building business intelligent solutions, developers also have access to OLAP for Silverlight. Stewart set out to review multiple control vendor offerings for the Silverlight platform. He specifically wanted to share his experience with fellow developers on his love for Silverlight and the grids, charts, and other controls inside OLAP for Silverlight. "ComponentOne Studio has an excellent control suite for Silverlight," said Stewart. "I think it is a much better and easier to program interface than ASP.NET and the kludge that it takes to make ASP.NET work." Stewart spoke about getting started, stating, "Like all control sets, including Microsoft's, there is a learning curve. It will take you a while to learn their way of doing things. Here is a hint: if there is a wizard type setup for the control, use it. They have it there for a reason. The wizard setup adds a lot of markup that you will not otherwise know that the control needs." He added that for developers who have users that need to do Microsoft Excel pivot tables on the fly from data on the website, they can find the answer in OLAP for Silverlight. "The C1OlapGrid control is really cool," said Stewart. "It can take the users out of Excel and give them the capability of doing it all on the browser. The best thing is that it puts the control into the user's hands without you, the developer, having to produce all kinds of different views into the data for them. They can just do it for themselves." What's Inside OLAP for Silverlight? Stewart shared his review for the four unique controls included in OLAP for Silverlight. The C1OlapPanel provides the raw data for the analysis using a DataSource property as well as a drag-and-drop interface for defining custom views of the data. The panel is visually similar to the Microsoft Excel Pivot Table UI. "The design of this interface makes it easy for an Excel user to pick up and use," said Stewart. "We found during the evaluation that the OLAP panel, which is the heart of OLAP for Silverlight, allowed a non-programmer that was familiar with creating pivot tables in Excel a near zero learning curve before being productive." The C1OlapGrid provides pivot tables with automatic data binding to C1OlapPanel objects, grouped row and column headers, as well as custom behaviors for resizing columns, copying data to the clipboard, and showing details for any given cell. 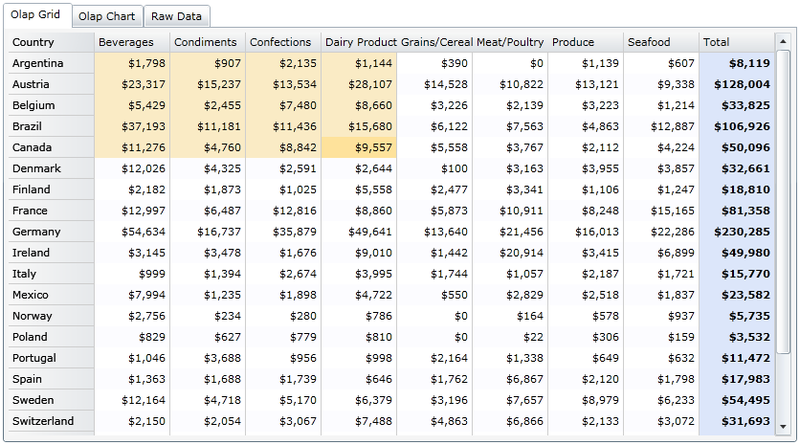 "Once the OLAP panel is defined, this is essentially the equivalent of the Excel pivot table itself. Again, the Excel user will be familiar and comfortable with the results presented in the OLAP grid," said Stewart. The C1OlapChart provides automatic data binding to C1OlapPanel objects, automatic tooltips, five chart types, and palette selection. "While Excel will also allow you to define charts against a pivot table, the C1OlapChart control binds to the OLAP panel and gets it data from there," said Stewart. "The user can be given an interface to change the chart types and the palette of colors for the data items so they can customize the chart. 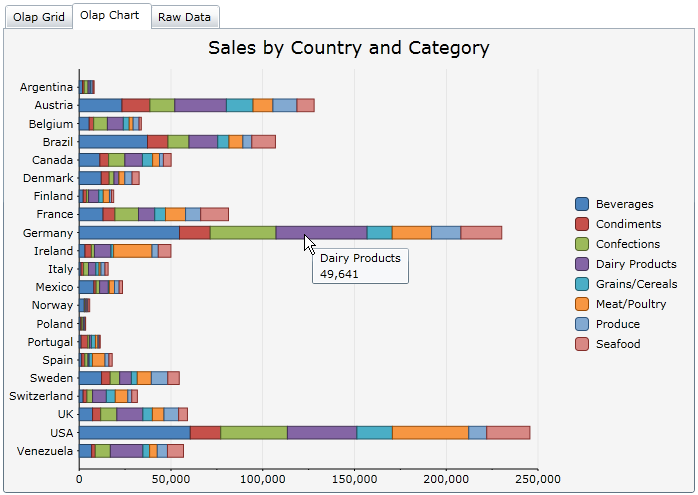 This makes it easier than Excel for novice users to be able to create charts their own way." The C1OlapPage control groups the panel, chart, and grid in one easy-to-use tabbed interface with a complete menu. Just drop the page control on the form and set the data source. Alternatively, you can develop your own custom interface using only the basic controls, C1OlapPanel, C1OlapGrid, and C1OlapChart, instead of the C1OlapPage. Stewart provided positive feedback for the C1OlapPage control. He stated, "Don't want to create a specialized page to do all of the work? Well, ComponentOne thought of that for you in this control. They gave you a page you could put all of your OLAP components into and the use a menu system to do everything they need to. Way to go ComponentOne! This is the biggest help they have with this control set. It saves a lot of specialized programming; something IT departments just do not have the extra time and resources for these days." One of the most widely used controls in application development is a data grid. With that comes the need for speed in a data grid which can be satisfied with the ComponentOne Studio Silverlight Edition DataGrid control (C1DataGrid). "In the testing we used the RIA data control on a data set of 36,000 names, and we were able to get data back extremely quickly, less than a second," said Stewart. He added, "Paging of data in the grid was good and fluid. I loved the filter capability that you can define for each column, and the grouping that you can allow. In the case of a very long list of names, the ability to group by last name and then filtering by the first few letters was great. The drag and drop for grouping made it simple for the end user," said Stewart. Today's business demands require a fair amount of scheduling, whether it be of a room, a group of people, or other resources. When building scheduling into an application, the ComponentOne Studio Silverlight Edition Scheduler puts all of the power in the developers' hands so they may customize just about everything they wish. Stewart detailed how a user can add custom fields and dialogs for filling in the appointments and creating custom views showing how resources are being used by a time line. "Let's say you have a service person scheduled now, how do you get him to his next place of service?" asked Stewart. "The answer is the map controls," he replied. "You can include the ESRI-based map control in your application and allow the service person to see the route from his current service location to the next one. No need to enter the from and to address information into other programs, you have it all in one spot inside of your application," said Stewart. Stewart’s overall rating for the ComponentOne OLAP for Silverlight controls is excellent. "You will not go wrong putting in the time and effort to learn their way of doing things and using these controls for your Silverlight development," he said. ComponentOne has the highest rated controls in the evaluation we did over the last year (11/2011 – 11/2012). Remember, there is one limit to what the controls can do for you…that limit is your imagination. The C1OlapGrid control is really cool. It can take the users out of Excel and give them the capability of doing it all on the browser. The best thing is that it puts the control into the user's hands without you, the developer, having to produce all kinds of different views into the data for them.